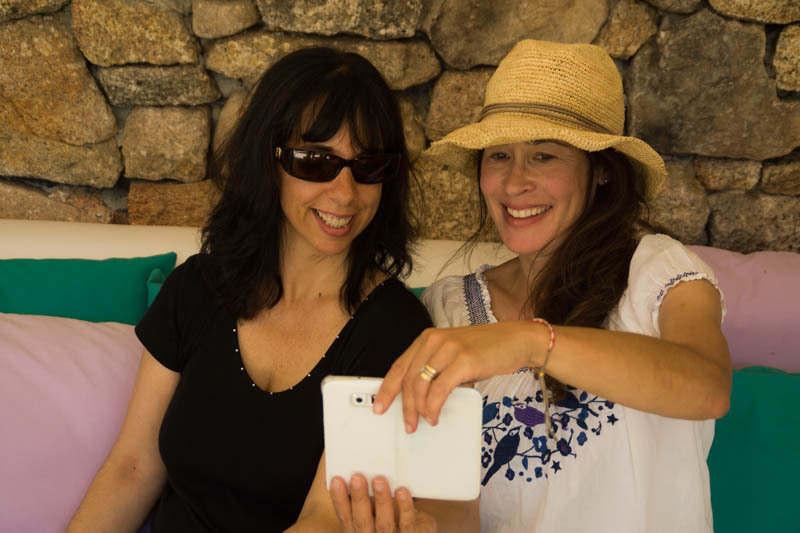 There are no coincidences Claudia Villax told me when we met on a hot summer day in a hidden protected spot of the S. Mamede Natural park in Marvao. 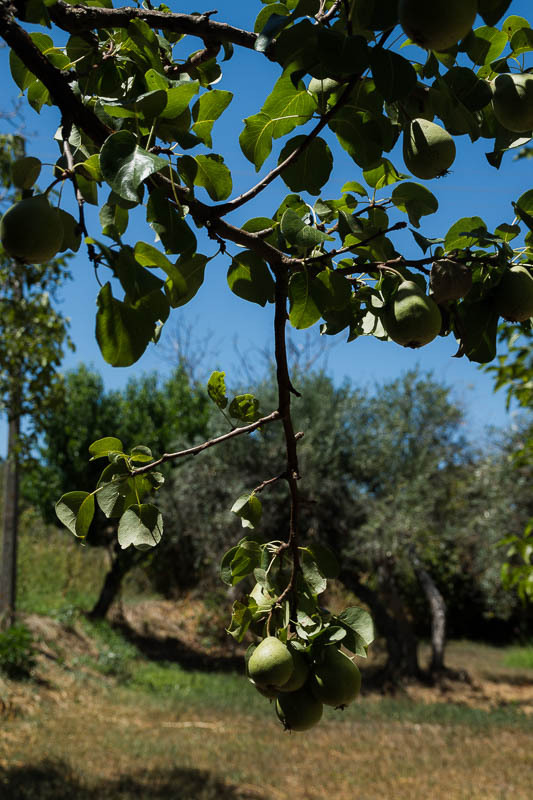 A piece of paradise with ancient olive groves, fruit trees, aromatic herbs and vegetables that the land generously offers to those who care for it. At a slow pace and respecting the seasons. No chemicals involved. Just a healthy, organic approach that allows nature to run its course. 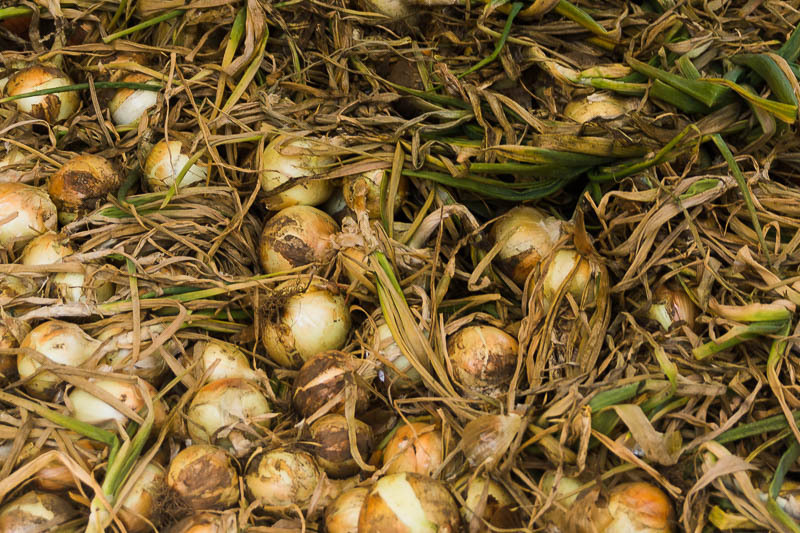 These beautiful onions had just been harvested. A land which throughout the centuries has welcomed different people. 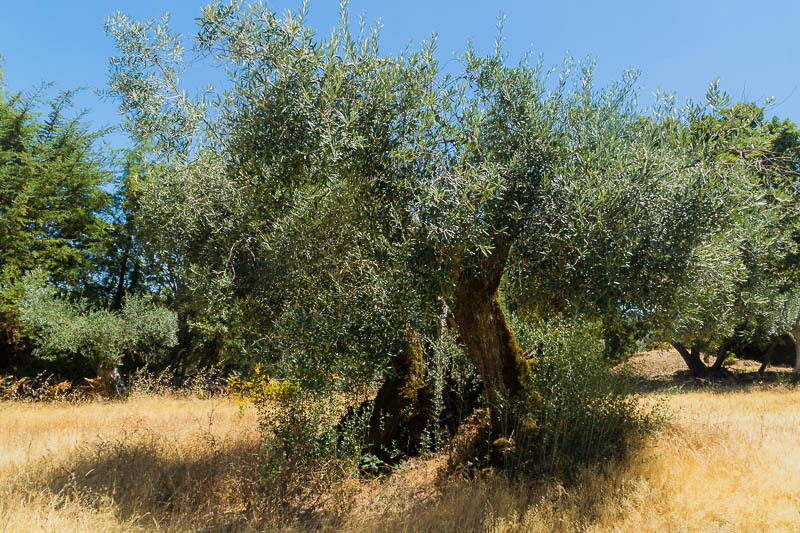 The Romans who planted the first olive trees, the arabs who continued the care and developed its culture and our direct ancestors who made it our own with love and dedication. There are clues of this rich past everywhere, a reminder of its historical background but the most important legacy are the living beings that still stand proudly and continue to provide healthy nourishment. 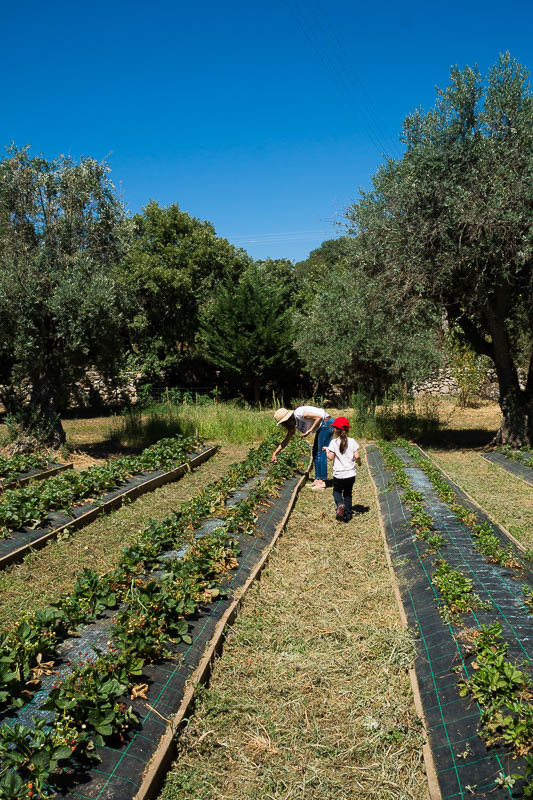 All due to Claudia and her family who since 2003 took over this legacy and with much love and effort have given the land back to its own resources and have been producing a very special organic extra virgin olive oil. Claudia’s family is part of a movement that I have been following very closely and have written about, small family businesses that still follow and respect traditional methods. People who went back to the land. Some have family ties to the land and go back, some don’t. Born and raised in cities, at some point they felt the need to change their lives. A wish to have a healthier lifestyle, somewhere where they can live and raise their children away from all the stress and pressure of city life. More important, somewhere where they can produce their own food. Healthy, natural food without the chemicals, the antibiotics, artificial modifications, the controversies with which we are confronted with on a daily basis. I had no idea who Claudia was until I bought her second cooking book co-written with her eldest daughter, called “Brunch”. Not living in Portugal I try to catch up every time I am on vacation. Part of the catching up always entails buying the latest books, to the dismay of my husband who always complains about the extra weight! 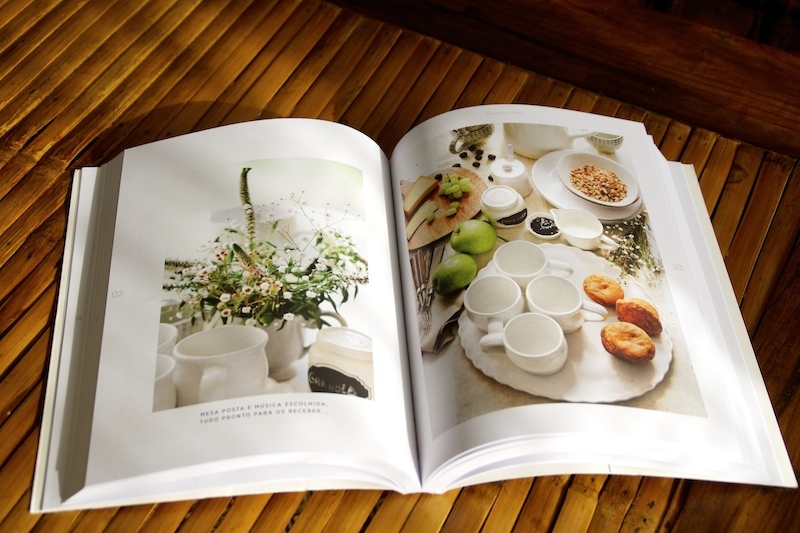 So when I opened Claudia’s “Brunch” and looked at the inspiring healthy recipes and pictures, I wanted to know more. But when I read about her organic extra virgin olive oil “Azeitona Verde” I decided to contact her. Besides the great amount of books, I always come back to Austria with a variety of Portuguese olive oils. For me it is the best in the world (I know I am biased!) but not as well known as the Italian for example since we don’t produce it in such great quantities for export. I have always wanted to know how organic olive oil is made. There are many things that make me proud of my country but the most important one is the generous hospitality. If you haven’t experienced Portuguese hospitality you must come to Portugal. Claudia had no idea who I was but answered my email in a generous friendly way by inviting me and my family to visit their farm and have lunch with them. When we arrived the strong heat of Alentejo greeted us along with the warm welcoming of Claudia and her wonderful son Miguel. The natural flow of the conversation made me feel as if I was visiting an old friend rather than a stranger. The saying “there are no coincidences” that Claudia used later in the day couldn’t be truer. We both believe there are people you are meant to meet in this world. That is how it felt. 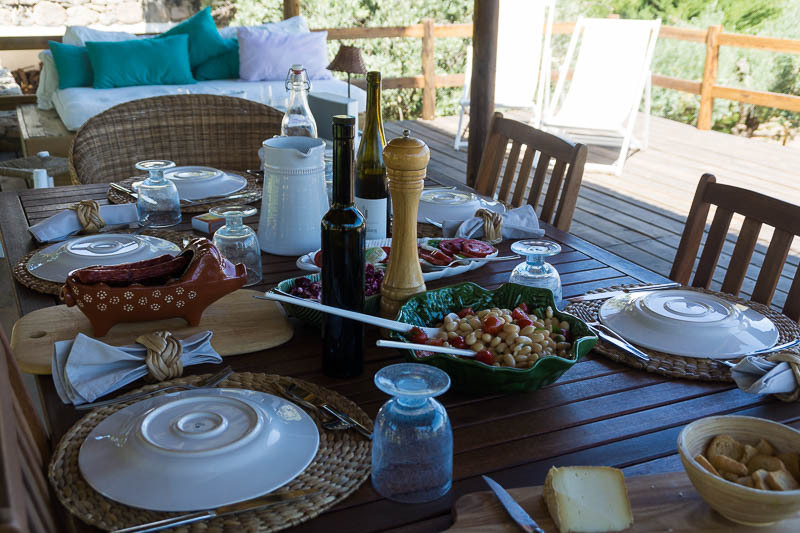 In spite of being very busy helping with the annual Classical Music Festival in Marvao, Claudia had prepared a beautiful table in the terrace outside overlooking the ancient olive groves. Delicious, fresh and appetizing dishes made with local produce. After such a nice meal, it was time to learn more about the olive groves and the special organic olive oil Claudia and her family produce. 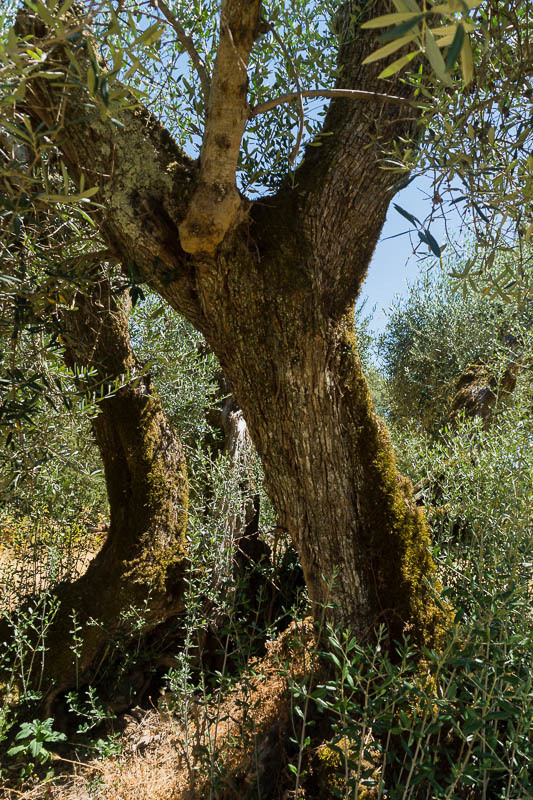 The organic “Azeitona Verde” extra virgin olive oil is produced with two varieties of olives. The Galega which is the smaller is indigenous to Portugal. It is a very special olive, sweet with a touch of unripe apple, a slight spiciness and a faint trace of dried fruit. The Cordovil is spicier with a more unripe feel and a lemon touch. When we visited the farm in summer the olives were still unripe. 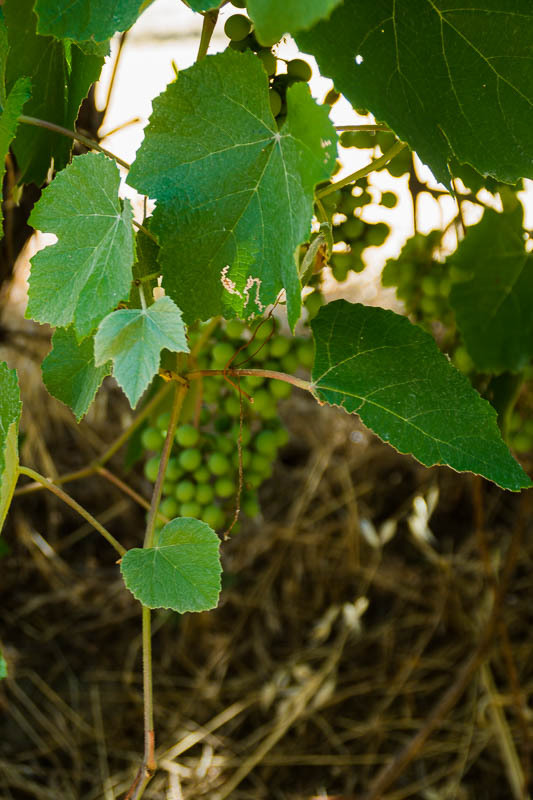 Usually in Marvao, due to the altitude and the climate, the harvest is done a bit later than in other parts of the country. It is generally in December or January. Claudia explained that the olives are picked entirely by hand and that the olive oil is extracted mechanically through cold press. 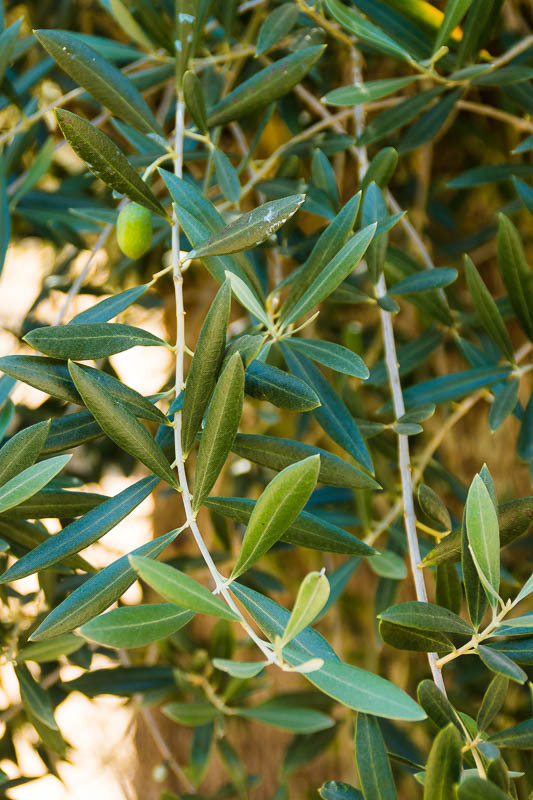 This gives the olive oil its deep green color and its fruity sweet taste with a slight spicy note at the end. It is also an olive oil full of good nutrients and anti oxidants. 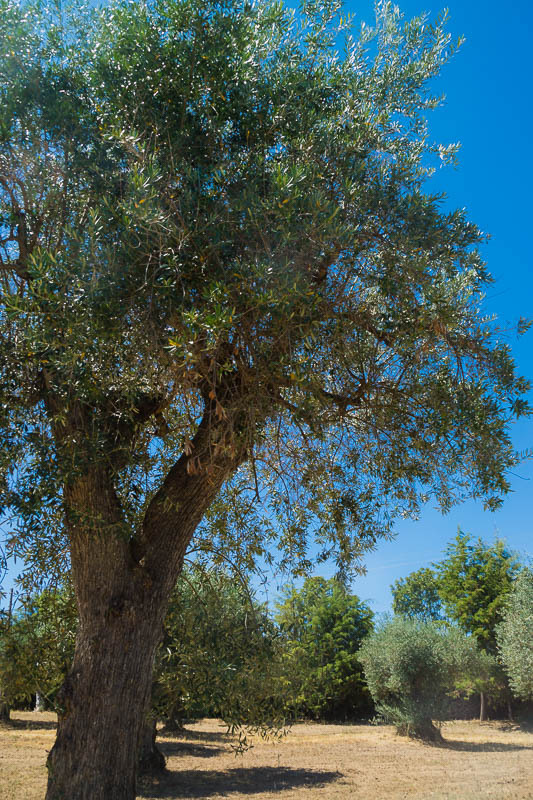 This is the result of giving the olive trees plenty of water, sunshine and above all allowing them time and space to grow according to each season. There is a lot of care and time invested and a will to protect the indigenous Galega type. These are trees which are difficult to grow, they require a lot of attention and patience. Unfortunately they are becoming a species in danger of extinction. 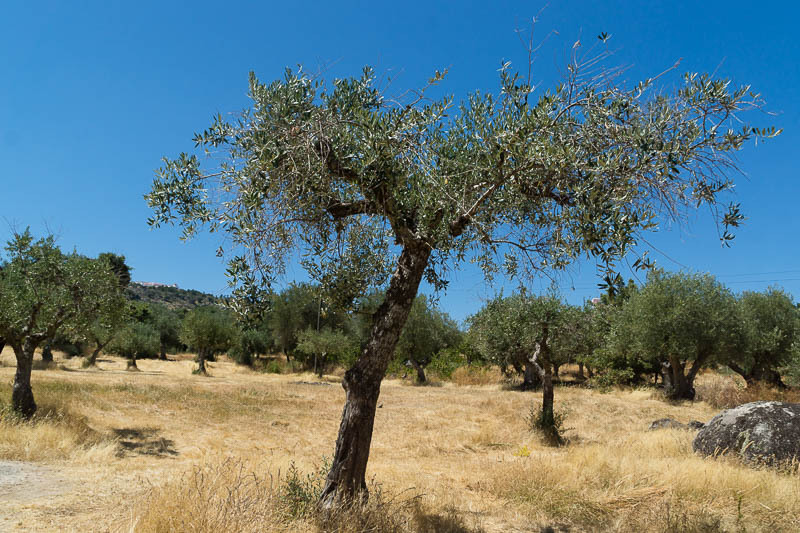 More and more farmers are taking down these trees in favor of a more commercially advantageous type of tree that is easier to maintain and produces olives in greater quantities. Claudia showed us the oldest olive tree in the farm. A tree that has withstood the test of time, I only wish it could show all that it has witnessed throughout centuries of history. 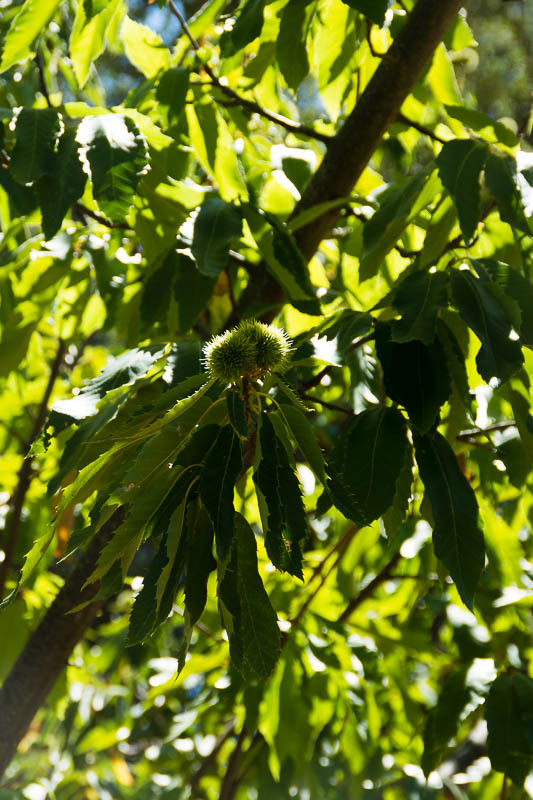 To help protect these trees Claudia has launched a campaign where you can adopt a tree for one year. It is a wonderful idea, you can find out more about it at their website www.azeitonaverde.pt. as well as further details about their organic farming. Before leaving, Claudia asked my daughter if she would like to take home a few sweet strawberries. Of course she said yes and they both went happily to the vegetable garden to pick some. Due to our expat life, it is very difficult to provide my daughter with such a vegetable garden of our own, so I was happy she could experience what it is to grow your own food and to have it at hand reach. She had great fun! Just before we said our goodbyes, Claudia generously offered us a bottle of her wonderful olive oil, no strings attached. The culmination of a true Portuguese welcome, one we were very grateful to have experienced and will never forget. I just saw Claudia now in Lisbon where I was on vacation again and surprised her with a bottle of styrian pumpkin seed oil, a specialty from Austria. We met for a coffee, all we had time for, this being one of the busiest times for her and for me the time to say my last goodbyes to Portugal once again. She told me that due to the heat wave this year, the harvest had to be done surprisingly early this year, already in October. But she was happy, she said the olives were specially good and she was hoping for an even better olive oil this time around. After the olive oil is produced there is a necessary resting period that should follow if you want to produce a high quality product. Only then it will be ready to be bottled and sold. This will take place in March next year. As always Maria, I admire the way you write and explain things. I wish I could be in that farm. Thank you so much for your support Carmen. I’m glad you enjoyed it, this was a really special place. Thank you Ado, I’m touched by your words. One of my aims is definitely to show people how special my country is and how much it has to offer. Maria it was great to meet you and your beautiful family!! It’s so nice when we discover someone who shares the same ideals.